German conductor Alexander Liebreich is one of the few Westerners to have visited North Korea several times. On his last trip, with the Munich Chamber Orchestra in November, he was surprised how much the situation has changed. "Is there anywhere in the city that we shouldn't go?" It is wise to ask this question early on in a trip to Pyongyang. I put it to our contacts at the German Korean Friendship society, who had helped organise our trip. "But… is it OK to just walk around Pyongyang, unaccompanied?" "Of course. Why wouldn't it be?" I was astonished. Their only recommendation was that we avoid visiting the train station and resist taking photos of military buildings. I travelled to Pyongyang with my orchestra to give workshops to students at the University of Music and Dance with the ambitious plan of putting on a joint concert after five days. I had been to North Korea five times but I soon saw that this time everything would be different. Whereas on my previous visits I had been accompanied for much of the time by officials and a translator, now there would be no restrictions on personal communication. The Pyongyang I discovered was quite different from the city I had last seen in 2006. There were more shops, more people on the streets. Coachloads of Chinese tourists emptied into restaurants and hotel lobbies - our hotel was packed. There was more electricity, a lot of renovation and new architecture. It all made for a different feeling. Part of me misses the sense of isolation that was so strong on my previous trips to the country. Walking along those huge, empty streets, you would suddenly find yourself in a pocket of silence. Different parts of the city would shut down and wake up with the erratic electricity supply. I don't much like the idea of North Korea adopting all the annoying stuff we have in Western consumer societies like the advertising and traffic. But anything that raises living standards must be welcomed. Ordinary people have so little in the way of material goods, heating and electricity. A new, more relaxed, Pyongyang was revealed to me several times during our trip. For example, there was the evening the orchestra attended a special reception that had been put on for us at the German embassy. When we arrived, we saw a crowd of about 60 teachers and officials outside the building who had come along to wish us well. North Koreans, hanging around outside a foreign embassy - this would never have happened a few years ago. On another occasion, our manager and I went for a stroll at around midnight. The streets were almost empty, except for three or four boys - about 16 years old - kicking a football about. We joined in. Ten minutes later, there were about 15 boys playing alongside us - young men who, it seems, no longer felt any compunction to avoid contact with foreigners. After all, we were in quite a public place, with cars driving past. And we had so much fun together - the ball kept getting stuck on a balcony and one of us had to climb up and retrieve it. We played like that for about two hours and then the street lamps shut off and we were plunged into darkness. We had to go back to the hotel. When I first visited the country 10 years ago it was impossible to get through a conversation with anyone without at least one reference to the "Dear Leader"- people were so desperate to demonstrate their loyalty. But this time, during the whole week we were there, there was only one mention of any of the leaders - some words of Kim Il-sung that were quoted during our tour of the university, to the effect that great artistry is a product of both talent and education. His grandson, the new supreme leader Kim Jong-un, is at present conspicuous by his absence in Pyongyang. His father and grandfather continue to stare down from the giant posters across the city, but not him. Perhaps that will change in time. Still, to begin with my orchestra were quite suspicious of everything around them. Some of them came up to me and said: "Everywhere we go in the city, people watch us. There are people who stand under street lights and pretend to read." I had to tell them that although it was quite possible that they were attracting the curiosity of the Koreans, it was a city tradition to read and study under street lights. Since ordinary people don't have any electricity in their homes, they don't really have a choice. In general, the orchestra adjusted quite quickly to the new environment. They could see the difficulties faced by the city's residents - there is no heating or proper water supply, and the musicians just don't have the materials they need. And there is this thirst for information which makes the spirit of a conversation quite different. People listen intently and remember everything you're telling them. The musicians have always connected powerfully with one another, and the ability to interact without constant supervision this time only strengthened that connection. 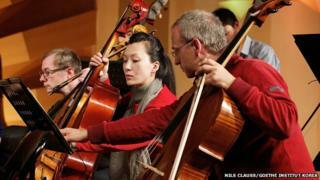 North Korean musicians are desperate for repertoire. The whole of 20th Century music is unknown territory. So we brought a piece by Witold Lutoslawski, who will be celebrating his 100th birthday next year. And we also brought music from 250 years ago - a Haydn symphony. The university students copied out their parts from the music through the night on the day of our arrival. This is what they have done on all my previous visits. The music from those visits has now found its way into their curriculum - Tchaikovsky, Brahms, Stravinsky. Alexander Liebreich's trips to Pyongyang are part of a programme of cultural dialogue between North Korea and Germany. After the collapse of the communist GDR in 1990, the newly-unified Germany made the decision to keep its embassy in North Korea open. Liebreich says both Koreas see Germany as a possible model for reunification. The Goethe Institute runs programmes with the North Korean government which include study exchange trips, German language teaching and support for the Grand Study Hall of the People, North Korea's national library. "The shared history of a divided country makes the relationship between Germany and Korea somehow special," says Stefan Dreyer from the Goethe Institute. When I was in Pyongyang in 2005, there was a particular idea that I was keen to get across to the young conductors I was working with. It was the idea of dialogue in music. I wanted them to understand there were two ways of seeing everything - you might call it active and passive, yin and yang - I call it the idea of symmetry and variation. For example, when a motif is repeated, it must sound different - it might be strident the first time, and soft and melancholy the second time. And when you are conducting - well, you have two hands. They must do different things. I believe that any society that is narrow-minded cannot make sense of that idea, but they could. When I'm in Japan or in China I often encounter conductors who seek to exercise absolute control over their orchestras, to utterly dominate them. But I have never encountered this tendency in North Korea. In a gesture that is not typical of professional musicians, in my experience, my orchestra forgot all about the scheduled rehearsal times and made themselves available day and night to the Korean musicians, to help them prepare for the concert. All the soloists went off with their counterparts in the university orchestra and worked one-on-one or in small groups. They communicated with snatches of English and German, but mostly through the music. On one occasion we lost our double bassists. We searched the university high and low, and eventually found them in the basement going through their music - it was just fantastic to see how close the contact could be. The concert was in a wonderful new concert hall. The organisers only had a few days' notice of the programme, but the hall was packed and a TV crew was there. The Korean musicians seemed to be very nervous. Alongside the Western music, we played two Korean songs alongside musicians using traditional Korean instruments. They have these huge bamboo flutes called taegum, that have a totally different timbre from Western metal flutes. It's a highly personal sound - the personality of the flautist matters a great deal. When that sound was then overlaid with that of the Western concert orchestra, the impact was overwhelming. Over the years, I have found that Koreans tend to cry very easily but at that moment I sensed my own orchestra's emotional response. We also played the Lutoslawski piece, Musique Funebre. This demanding work for strings ends on a moving cello solo. Our cellist knew that there was no way her Korean counterpart could play this music with her shoddy instrument, so before the performance they switched. It was composed in 1958 but for North Korea it was a premiere. When you play a piece of music for the first time it swells into this huge thing with a new, unstoppable energy to it. I see my job as a conductor as trying to achieve that sound with every single concert. The feeling I get when I conduct in North Korea is something I try to hang onto after I leave. Sometimes people ask me: "How can you go to a country with so much poverty and just take a symphony?" But music is a basic need. The harder life becomes, the more important it is. When all is said and done, culture is about the dialogue between people, about how we should treat one another. It is something that is all too easy to forget in a European concert hall. Alexander Liebreich was interviewed on the BBC World Service programme The Forum.